There’s a perpetual clock hanging in the northern sky. The edge of the Big Dipper (Ursa Major) is the hour hand for this backward-running, 24-hour timepiece. Midnight is at the top, and noon is at the bottom. This method works best in the Northern Hemisphere, where the Dipper is more often above the horizon. The farther north you go the longer the Dipper is visible. At latitudes greater than 41° N it never sets. Farther south, it skims below the horizon at it’s lowest arc. The Dipper is a circumpolar constellation for most of the Northern Hemisphere — that means it revolves in a counter-clockwise direction around the North Star (Polaris), and is visible in the sky all night (or most of the night). In the graphic above, Dipper Time (TD) = 20:00. Not all the stars in Ursa Major appear the same brightness, but they’re shown that way for simplicity. 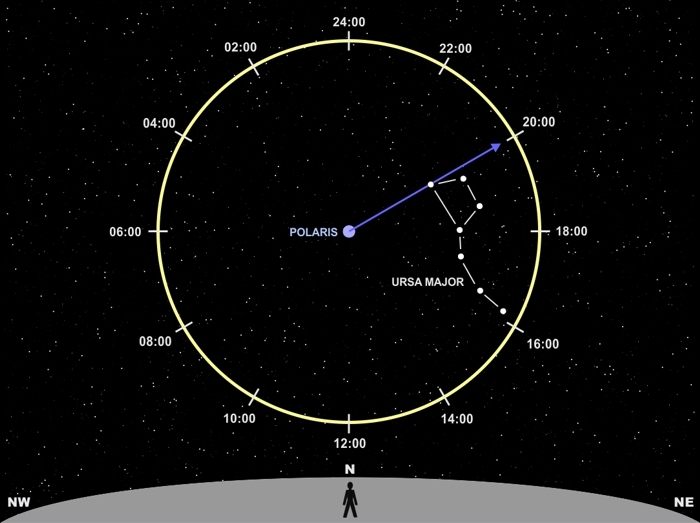 Likewise, Polaris is not that bright a star at magnitude +2, but it’s shown as a large blue dot since it anchors the “hand” of our star clock. Locate the Dipper, visualize the 24-hour clock and hour hand, and read the current Dipper Time (TD). Compute the month number (M) according to: Jan 1 = 1, Feb 1 = 2, Mar 1 = 3, etc. (fractions acceptable). T = TD – (2×M×100) – TU = 20:00 – (2 x 3.5 x 100) – (-5:00) = 20:00 – 07:00 + 05:00 = 18:00 = 6:00 pm. So get out there and test your visualization skills tonight. The arithmetic isn’t that difficult. The month number (M) is easy to remember, and fractional months can be rounded to 0.5 (0.25 if you’re ambitious). And once you know your UT correction factor (TU) it never changes unless you move. Just be careful if you need to subtract a negative for TU. Also, if your time zone uses Daylight Saving Time (DST), when on DST you’ll need to add 1 hour to the value of T calculated from the formula. If you’re not currently on DST, the calculated value of T will be correct. For the ultimate star clock experience, print the graphic (as a negative image) on transparency paper. Then trace the clock and numbers with a glow-in-the-dark marker. This can be a cool tool for practice, or a great science fair project. But you won’t need it for long — reading the star clock will soon be as easy as reading a clock on the wall.